WASHINGTON (AP) – The Trump administration imposed sanctions Monday on the state-owned oil company of Venezuela, a potentially critical economic move aimed at increasing pressure on President Nicolas Maduro to cede power to the opposition in the South American nation. Maduro’s increasingly isolated government would lose access to one of its most important sources of income and foreign currency along with around $7 billion in assets of Petroleos De Venezuela S.A. under the sanctions announced by Treasury Secretary Steven Mnuchin and national security adviser John Bolton. The move follows the unusual decision by the U.S. and other nations last week to recognize the opposition leader of the National Assembly, Juan Guaido, as the interim president of Venezuela instead of Maduro, who was re-elected last year in an election widely seen as fraudulent. The once prosperous nation has been in an economic collapse, with several million citizens fleeing to neighboring countries. 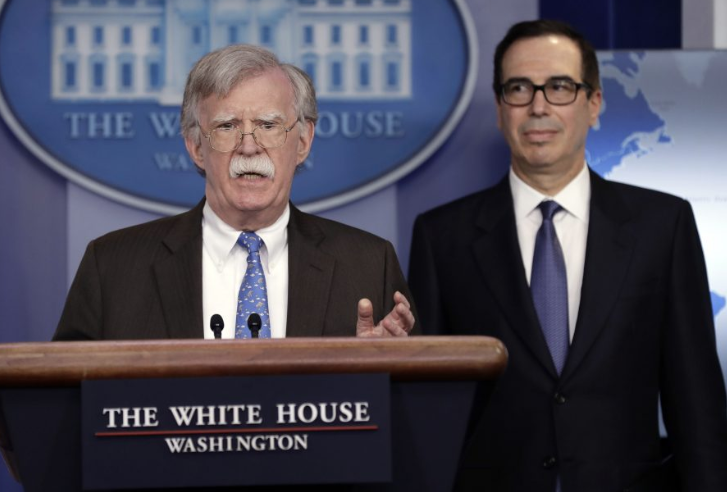 “We have continued to expose the corruption of Maduro and his cronies, and today’s action ensures they can no longer loot the assets of the Venezuelan people,” Bolton said at a White House news conference. Bolton said he expects Monday’s actions against PDVSA — the acronym for the state-owned oil company —will result in more than $11 billion in lost export proceeds over the next year. Sen. Marco Rubio (R-Fla.), a vocal critic of Maduro who has called for such sanctions, welcomed the move even before it was announced. The sanctions will not likely affect consumer prices at the gas pump but will hit oil refiners, particularly those on the U.S. Gulf Coast. Still, Venezuela has consistently been the third- or fourth-largest supplier of crude oil to the United States, and any disruption of imports could be costly for refiners. In 2017, the most recent year that data was available, Venezuela accounted for about 6 percent of U.S. crude imports. Valero and Citgo are among the largest importers of Venezuelan crude. Mnuchin said the Treasury Department also took steps Monday to authorize certain transactions and activities with PDVSA. He said Citgo assets in the United States will be allowed to continue to operate — provided that any funds that would otherwise go to the state-owned oil company be sent to a blocked account in the United States.